Rabbits are small, non-hostile animals which will flee from you. They are sometimes hunted by foxes and other larger predators. Rabbits are rather small yet very fast, making them a tough hunt. Killing a rabbit adds to your "Bunnies Slaughtered" statistic. For information on dead rabbits, see this page. 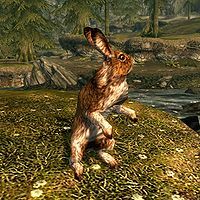 Rabbits can be brought home as pets by adopted children in Hearthfire. This page was last modified on 1 September 2018, at 11:27.